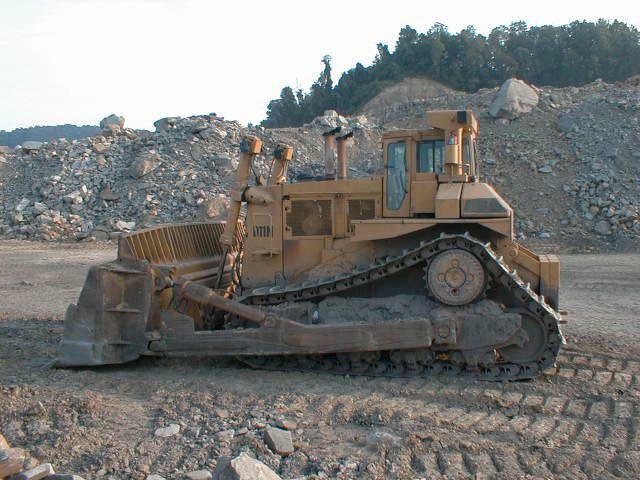 For the sake of completeness and not because the author has one of these parked at the back door in case he wants to go for a Sunday drive you will find on this page the almost world's largest bulldozer. Komatsu makes a larger model known at the 575A-2 with 1100 horsepower, but it is not all that common as it weighs over 150 tons and features an 11 foot high 24 foot wide blade. However, with a weight of around 100 tons, and 770 horsepower, the Cat D11 is clearly one of the big guys. The models shown here (actually 3 different machines) are pre 1999. For 1997 Cat has introduced the D11R which is available now with an estimated selling price of around $1.1 million US. This writer never having seen one of these machines in person can't add much information about them not shown in the picture, but it is clear that they are just large. Fiat Allis got credit for making the first commercially successful dozer over 500 HP when they produced the FA 41, which is the big brother to the FA 31 shown elsewhere on this site. 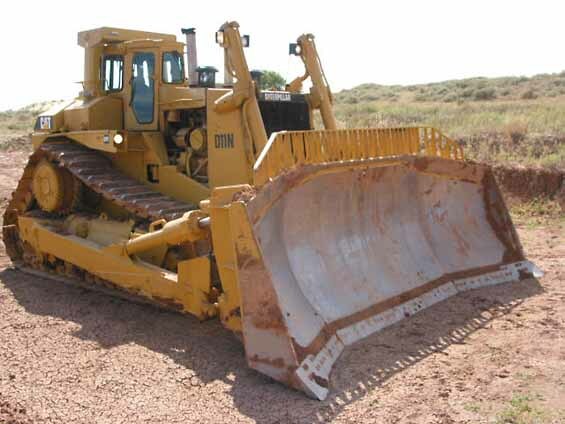 Cat wasn't about to let some upstart end run their market dominance in the big dozer market so the D10 and then the D11 took care of the problem. 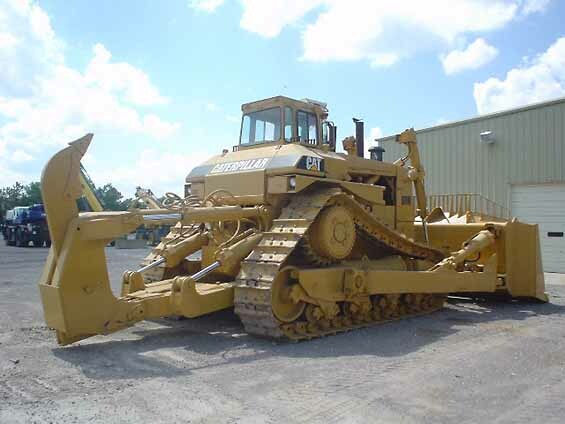 These dozers are generally regarded as big enough, and left the D-9 which for 20 years was the 'big dozer' 2 sizes down. The D-9 has, of course, grown over the years. The very first D-9's (18A series) featured horsepower in the low 200's, this has grown until the current production model D9R is a 50 ton tractor with 405 hp. These machines are so big, so heavy and so expensive that you are unlikely to find them anywhere except in the mining industry. The crawler tractor was invented and perfected in the Sacramento Valley of California as a farm tractor, by Holt and Best who were merged in 1925 to form Caterpillar Tractor Company. The vision of the crawler then was to pull combines and heavy equipment on the typical soft ground of the Sacramento delta. A third party came up with the idea of putting a blade on one of these things in the 1930's. He perfected the design as one of the contractors who built the Hoover Dam. It wasn't until after World War II that Caterpillar actually manufactured a blade for their tractors. Now we have these things. Interestingly in many many jobs the Dozer is falling into disfavor. Loggers used to use them universally for logging and they were everywhere on highway construction jobs. The advent of the excavator with dozer like tracks has displaced many traditional track dozers. Loggers use the excavators for logging in a technic called 'shovel logging' in the USA and called "hoe chucking" in Canada. Anyhow, wherever it is flat enough for a track machine to get out, its an modified excavator not a dozer that goes out. With a grapple instead of a bucket they pick up the log (as in a log loader), swing 190 degrees and set it toward the road. Then they do it again. Just one man and no choker setting. Other places rubber tired skidders have displaced dozers. Between the two, many loggers no longer own a dozer. On highway jobs the excavator has displaced much of what the dozer did. Before the days of the dozer much road work was done with a cable shovel. They were clunky and awkward, but today's excavator gets around as well as a dozer. Indeed they are mounted on dozer undercarriages. Crawlers have even been displaced in the scraper business. In the 20's and 30's before anyone thought of putting a blade on a crawler tractor, they were used to pull scrapers to move dirt. Ultimately, the towed scraper was displaced by an engine driven scraper on rubber tires. These scrapers weren't very good at loading themselves, and so dozers with blades were used to push load them. Now however the dozer is even losing out there. The engine driven scrapers have become million dollar yellow toys, while contractors have figured out that they can buy a giant articulated farm tractor, and a couple smaller scrapers for under half a million dollars. The towed scrapers are hooked behind the farm tractor in tandem, and filled one at a time. No push dozer is needed. the big low pressure dualed farm tractor tires will provide more traction than the high pressure scraper tires at less cost, so the dozers lose out again. The place they remain, however, is in the rock. Big soft rubber tires are cut to ribbons in the rock, and when there is rock to move dozers do a fine job of it, and they don't make one too big to push rock. When you are wanting to move rock the biggest dozer you can afford (and get to the job site) is the right size. Since these machines have to be at least partially dismantled to move, their prime location is a mine or quarry where they will live until they are worn out.